We can now confidently conclude that at least some of the AK-103 rifles seen in Libya were manufactured in Russia. What remains to be seen is how many rifles were purchases from Russia, and whether or not the proposed USD $600 million factory to manufacture the AK-103 under license has been made, or will be made, operational. Update 05/11/2011: I’m curious as to how many of the 103s seen in Libya are 103-2 variants. If anyone has, or finds, photos from Libya showing receiver detail, please contact me. Update 30/11/2011: @blabeen, a former Major in the Libyan Army who defected to the rebels’ side, has let me know that he has seen “many” AK-103s, and that all of those have been 103-2 variants. He also notes that the AK-103-2 is known locally as ‘the Israeli Kalashnikov‘. This is quite odd – no word on why as yet. Update 05/12/2011: You can read about weapon optics of the Libyan conflict, including models spotted on AK-103s, at my personal blog. Detail of the serial number, designation, and factory mark. So photos on a blog titled Libyan Proud of someone holding a Russian made AK103-2 in an area which looks like almost anywhere in the Middle East or North Africa (or even Coober Pedy) means that Russia was exporting these rifles to Libya? Any chance of some more substantive proof? 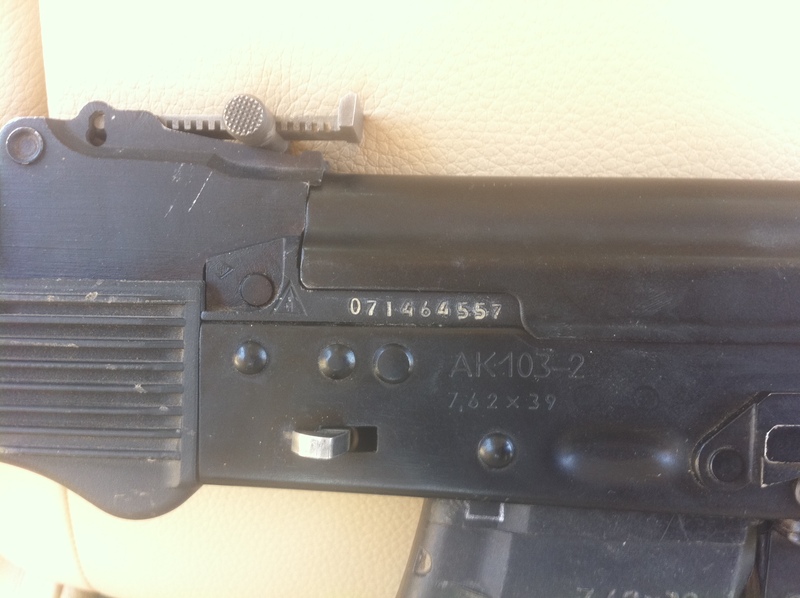 Between photos of Libyan rebels, and pro-Gaddafi forces, holding 103s, then photos of a shipping crate containing 103s and indicating they were shipped from Russia, and now photos of a receiver with serial numbers and factory markings, I think we have enough to safely conclude that at least some of the AK-103s sighted in Libya are of Russian origin. Yes, I saw them, and it is safe to say they’re of Russian origin, but saying that and saying they were part of an transfer between the two countries is quite different. This current blog post provides no more evidence to support the assumption made in your previous update. You stated that we should work on 10 rifles per crate, however this would account for roughly 35kg of the 59kg net weight of the contents of the crate; would these rifles be shipped with supporting equipment in the same crate (magazines, cleaning equipment, etc) to make up the difference in weight, or would the crates hold 15 rifles instead of 10, or something else completely? The information provided isn’t adding up, and the picture of the crate would not lead me to make the same assumption that Marsh has regarding authorised Russian exports of AK-103’s to Libya. As you said, more information would be ideal. I agree, more evidence would be ideal. Given the deal in the works to license-manufacture the 103 in Libya, however, I’m fairly confident the ones we’ve seen are from a government-government transfer. The serial numbers also indicate the weapons were manufactured recently. What would your alternative be? There aren’t a lot of ways to get Russian-manufactured AK-103s. That’s true, and would lead to the same assumptions being made. I would suggest it’s just as possible they’re from an unofficial transfer as an official one, even if that means they were sold to another Arab state and have since been passed on. Belarus do not, to the best of my knowledge, produce the AK-103, and evidence that has been uncovered points quite clearly to a Russian connection. However, I will gladly look at any photos you have. Please send me a photo showing the whole weapon, as well as close-ups of the receiver (in particular the markings shown in the photos above). You can email me at: nic -at- securityscholar -dot- com -dot- au. Belarus would be the third party of any trans-shipment. If the trasfer was Informal. So he might not be completely wrong. But I’m willing to bet you haven’t received that picture yet. I haven’t. And the crates we saw were marked as a direct transfer from Oktyabrsk to Tripoli.